Check out this amazing video of a multi-pitch artificial route bolted onto the face of a Swiss dam. Also, we checked out Dinosaur Valley and Big Rocks Park in Glen Rose this weekend. We’ll give you the full update soon. By now that government stimulus check is probably burning a hole in your pocket. If you’ve not already spent it all filling up your SUV, consider building a garage climbing wall to get your fix. And if you’re feeling really industrious, you can even make your own holds. The following are pretty interesting. Time for the Sunday Video Roundup. The first is of a beautiful 5.13 overhang somewhere in Austin. Pretty sure it’s Flat Creek, but don’t ask me how to get there because I’ve never been. Its no secret that the state doesn’t exactly look favorably upon bolting any routes on public land. However, setting up a top rope or bouldering aren’t too big a deal as long as you use discretion and act responsibly. We’ve been checking out parks in the vicinity and have run across a few places with obvious potential. 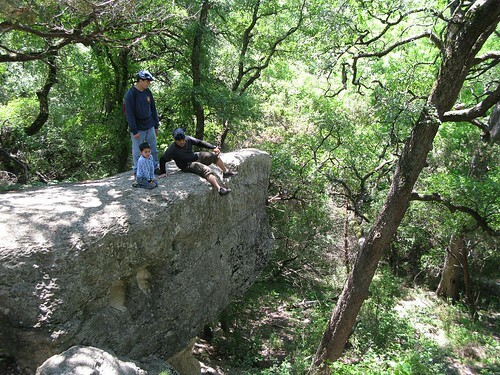 One such place is Big Rocks Park, a city park in Glen Rose with what could be decent bouldering right on the Paluxy River. Another is Dinosaur Valley State Park, the park made famous for the dinosaur footprints embedded in the limestone riverbed. The limestone in these parks is the same that made Cleburne famous back in the day, and there’s gotta be more in the area. We’re hoping to do an exploratory trip in the next few weeks and we’ll let you know what we find. Feel free to beat us to the punch. Some south of the border El Salto, Mexico dyno action. Does anyone know the local contact for Access Fund? Their website lists an email address for a website that doesn’t exist. It’d be nice to actually get someone working to reopen our most favorite local pile of choss, Paradise on the Brazos. Heck, we’d be glad to take part in the efforts ourselves if anyone has any bright ideas.